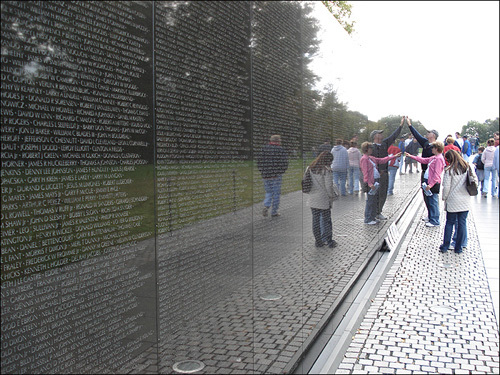 Some of these brave men died in the jungles of Vietnam while others died in Medivac units or hospitals in Japan and America. A dead soldier can surrender his life anywhere in his service to his country. It really doesn’t matter where this happens. The location of a soldier’s death in now way colors his sacrifice to his country. Fighting in Iraq is mainly in urban areas. Soldiers who are injured are quickly evacuated with armored personnel carriers or helicopters. It’s a much more efficient system than what was possible in Vietnam, but for those that are seriously injured it means that death is more likely to happen while they are in transit or at the treatment facility. Under the new reporting system, deaths that happen en route or post evacuation are not counted as combat deaths. This is why the number seems unusually low — a little over four thousand as of 2009. This writer happened to visit Iraq back in 2001, at the time Saddam Hussein was still in power. The world’s nations were imposing an embargo on all imports in an attempt to punish the nation for invading the neighboring nation of Kuwait. I remember the good people of Iraq who treated me with kindness and hospitality — even while knowing I was an American. Despite the embargo on such vital things as medicine and hospital supplies, the markets were thriving with local produce. Children freely played in the streets and there was laughter. To see what this war has done to Iraq is especially painful and speaks loudly of the immorality that has caused these innocent people to suffer. And now, to see that this same immorality extends to the American people in the form of deception and lies crosses the line. I live in a small town in New England. We have known of many casualties from Iraq — too many. Yet the numbers being reported in the media make it seem that this is a rare occurrence. Just over 4,000? How can this be? In short — it’s NOT. What will it take to awaken people and make them angry enough to hold our government responsible for these lies? A democracy is only good if its people are well informed. How else can we make decisions abou what’s best for us? If we are fed s*** and kept in the dark we truly are a nation of mushrooms. Before I end this I want to say a big THANK YOU to all the vets who put their country and its people before themselves. We are proud of you and believe that you put your lives on the line for something a little better than what we are currently experiencing with our government. Thanks to you we’re still a democracy. So it’s up to us, the people you fought for, to make your effort worthwhile.